When it comes to politics, what’s love got to do with it? American Enterprise Institute’s Arthur C. Brooks (right) and University Professor Danielle Allen agree to disagree (and sometimes to agree) over the political necessity of love. Love might not be all we need, but its lack is surely tearing us apart. That was the point made by Arthur C. Brooks, president of the conservative think tank American Enterprise Institute, during a Wednesday evening discussion with James Bryant Conant University Professor Danielle Allen at the Institute of Politics’ John F. Kennedy Jr. Forum. Love’s potency cannot be underestimated, began Brooks, who is also the Beth and Ravenel Curry Scholar in Free Enterprise at American Enterprise. Discussing the powerful effect of oxytocin — the “love molecule” — and its potential for treating heroin addiction, he moved on to talk about how love of another sort might be able to treat the toxicity of our current political situation. “Competition: That means disagreement,” he said. “Ninety-three percent of Americans hate how divided we’ve become in this country. 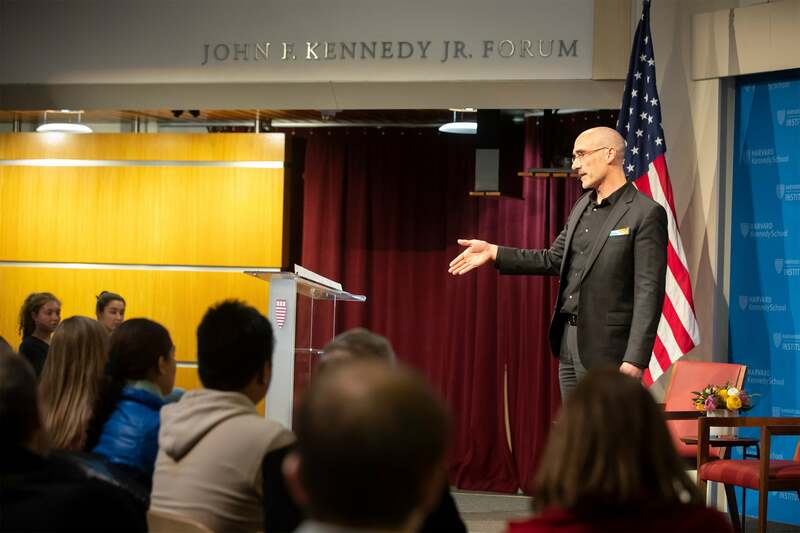 It’s a love problem,” Arthur Brooks told his Kennedy School audience. She also called out Brooks’ use of the word “kumbaya,” both in his comments and his book, as shorthand for a faked feel-good camaraderie. “Your book focuses on the contempt we feel in 2019,” she said, citing the battles between red and blue. “But culture is a big, complicated thing that teaches us our moral orientation. Our language is a carrier of contempt. You used ‘kumbaya’ contemptuously. I hear that and I hear my culture being disrespected.” She then played a 1929 recording of a singer from Sea Island, Ga., performing the spiritual with reverence. Brooks accepted the correction.